It’s important to understand that despite many misconceptions and misinformed individuals, underglow is not illegal in all of United States. 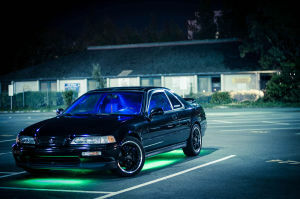 Some states like Kansas or California permit using car underglow, but at this point there are only five states which specifically have underglow legally allowed. On the other side of the coin, 9 states have completely banned neon underglow on public roads. A few of these latter states went as far as to prohibit the installation of neon underglow, so even if you intend to use these lights on private property and never in public, you are still in violation of state laws simply by having a vehicle equipped with this undercarriage lighting system. So why is underglow illegal? What makes these states allow or disallow car underglow? The biggest and most important reason is the fact underglow is considered a distraction. While we at NeonLaws.com clearly do not completely agree with this assessment, we’ll do our best to give some reasoning in order to help you understand why car underglow is sometimes illegal. If you look at it objectively, underglow is a decorative, vanity item. It’s not essential for the operation of your car in any way. Some car owners believe it makes their vehicles look better or cooler, while some disagree. Regardless, if you made the choice to install it on your car and drive with the lighting on then you believe it makes your car look better. While driving, you’re the only who does not see the underbody glow. Other drivers will notice it, so claiming you don’t care what others think is not very truthful. And if the point is for others to notice it, then it is reasonable to assume it may in fact cause a distraction. If you truly don’t care about the opinions of others, then you should have no problem using underglow only while parked on private property, which is perfectly legal in vast majority of states. However harmless it may seem undercarriage lighting has the potential to distract drivers, and sometimes even a split second is enough for an accident to happen. We’re not saying it’s likely or even probable, but there’s always the chance. This is why some states like Washington and Illinois completely banned the usage of street glow. Majority of U.S. does not have laws against underglow, but every state has some kind of restrictions on what kind of lighting is permitted on vehicles. For example almost every state prohibits the use of any kind of flashing or rotating lights, not just because those are reserved for emergency vehicles but because those truly can be distracting. Even in the few states where flashing lights aren’t specifically prohibited we strongly recommend never using them. Honestly, can you imagine if every second car you pass by had flashing lights? Nobody can claim it would not be a huge distraction. There’s also people with medical conditions such as epilepsy who may have different negative reactions when exposed to flashing lights. Other common restrictions include the usage of blue, red and green colored lights, which are typically reserved for use on emergency vehicles. Considering the fact underglow is seen by other drivers and not you, it’s reasonable to assume it may cause a distraction. Therefore some states consider it an unnecessary risk and have outlawed its use on public roads, while there are a few states which are more liberal and specifically permit using underbody lights even while driving. There are only 9 states where car underglow is illegal, and we consider it legal to use in the other 41 states. All 50 states have different kinds of restrictions on aftermarket car lights, so make sure you always read neon underglow laws carefully and avoid using any restricted colors, placements, or other prohibited lights which may violate the laws of your state.